The menu changes every time they open, and specialties range from turkey pozole to hearty fish chowder, quinoa salad to broccoli pasta, and blueberry scones to cheesy pigs-in-blankets. They use only organic, low-sugar ingredients and sustainably-raised meats or vegetarian alternatives. But this is not a fancy, five-star restaurant. It's an elementary school, and all the chefs are fourth and fifth graders. 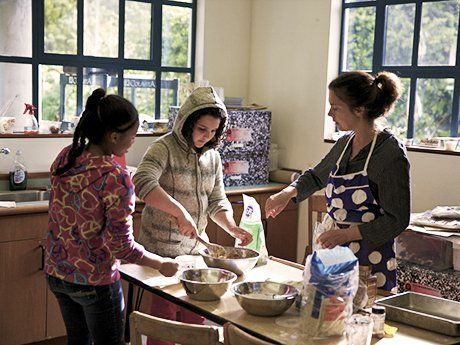 Anne Malamud’s 4/5 class at Mills College Children's School, the laboratory school for the School of Education at Mills College in Oakland, California, is learning how to run a successful business and to make a difference in their own community. Calling their entrepreneurial venture the Happy Eating Place (HEP), the students originally set out just to prepare healthy snacks on campus and raise money for a yet-to-be determined nonprofit organization, but Malamud saw the opportunity for a service learning initiative with broader goals that would include social justice issues within our society. Now in its second year of operation, the HEP's mission has grown to include educating others about nutrition, the importance of sustainable farming, and the roots of hunger in America. This has included writing pamphlets, giving talks, and creating a presentation. Service learning projects can be developed at any grade level. It may require extra work when teachers alter their plans to integrate student-driven, hands-on lessons in their math, writing, social studies, and science curricula, but that work pays dividends in student engagement. Here are five easy steps to start a service learning business model in your classroom. 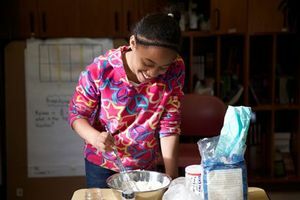 Fresh off a nutrition unit where they learned about digestion in the human body and picked up a few simple, healthy recipes, the class became enthusiastic about the idea of using food as a basis for a service learning project. Malamud saw an opportunity to teach basic economics in the context of running a business, and brought in a financial planner (one of her parents) to explain about initial investments, gross and net profits, and how to price items and predict sales. In order to run a successful classroom business, every student needs to have a job -- cooks, servers, cashier, accountant, marketing team, even dishwasher. A range of jobs can accommodate the range of abilities in the group. Artists who like to draw and make posters are great on the marketing team, those who like to move around can make great servers, and those who like to cook can cook! Students learn that every job is important, and they see the interconnectedness of each job. They are more invested in the project, and more excited about working together toward a common goal. While cooking, students practice multiplying and dividing fractions to increase and decrease their recipes. To drum up interest in their healthy bake sales, the marketing team writes and maintains a blog and visits other classrooms to talk about their mission. This year, HEP expanded to include a restaurant, where students served a four-course meal to families and staff, researching recipes related to their current social studies unit (i.e. Old World vs. New World foods). Students are more engaged and excited about doing class assignments when they relate to their business model. Since HEP is centered on a cooking model and the class had already studied a unit on nutrition, Malamud had an idea to incorporate a particular service learning component within their business project. She asked her students, "What happens when people don't have access to good nutrition?" To answer the question, she showed a documentary called A Place at the Table about hunger in America, organized a field trip to a local sustainable farm, and set up a volunteer partnership with the Alameda County Community Food Bank. Students decided that they wanted all of their HEP profits to go to the Food Bank, and over the course of two years, they've donated close to $1,000 to that cause. And because each dollar raised for the Food Bank has the buying power of four dollars, students can use the Food Bank’s online shopping cart to see just how much their donation is buying. After their first few initial successes, students voted to make organic fruit smoothies for one dollar each at their next bake sale. Malamud knew that the ingredients would be expensive, but she let the students learn their own lesson and lose money on the sale, prompting the team to think about whether they could serve smaller portions or charge more. Another time, a measuring error resulted in salty scones, and the marketing team went class to class talking to their fellow classmates about the error and rebuilding trust in their product. In their second year as a business, HEP added a new job -- a Satisfaction Manager who interviews customers after each sale so that the team can discuss what worked well and what they might do differently next time. Sometimes, this requires changing the recipe, increasing advertising, or surveying their clientele. Even if the only solution is to take an item off the menu, the students learn an important business lesson. The Happy Eating Place is an unusual leadership opportunity for fourth and fifth graders, and perhaps that is the reason for its success. 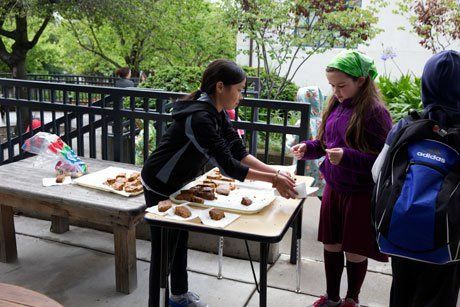 Even young elementary students can excel when given the hands-on experience of running a business, and also seeing how they can effect bigger change in the world. Please tell us about any service learning or student-driven nutrition projects at your school.